I started boxing at Epping Forest Country Club in Essex when I was 16. My boxing instructor was boxing promoter and local hard man Alan Mortlock. From here, I started to get into Kung Fu and more traditional martial arts. I started to train Wu Shu Kwan, achieving black belt status. After 6 years of training in Wu Shu Kwan, I felt that I had progressed as far as I could within the system so I started to seek alternative martial arts to train. After witnessing many knife incidents, I realised that I needed to learn a weapon based martial art. I started to train Escrima at a club in Romford which was run by Jay Dobrin and Phil Chenery. My love for weapon training was cemented here. I moved to East London and seeked out a club which was closer to where I lived. Luckily, I found Escrima Concepts in Tottenham, run by Paul Leslie. This is my martial arts home. I have been training with Paul Leslie and Master Steve Tappin and Wayne Tappin for over 10 years now, working my way up to 12th Grade and Instructor. Working with Paul, helped me to become a fighter and to become aware of situations which may arise. Paul helped me to win the gold medal at the 2005 Escrima Concepts Championships in Denmark for light heavyweight category as well as winning and taking part in many other competitions. Throughout this time I was also training MMA and Muay Thai. I trained MMA for 5 years; my MMA training took me to some of the most important MMA gyms in London, such as, London Shootfighters in Kilburn, Pancrase London in Bethnal Green and the MMA Clinic in Islington. Due to a serious neck and back injury which I suffered on the mats, I had to give up MMA, although MMA and grappling are one of my passions and always will be. This however, has allowed me to focus on Escrima and to spread the system to as wide an audience as possible. Escrima is the perfect martial art for the street. Escrima, from the very first lesson teaches you how to handle and use weapons, as far as I am aware no other martial art does this. It does not matter which weapon you use, it could be a pen, mobile phone, a bottle, what actually matters is that you understand the Concepts involved. When you understand the Concepts, weapons become easy to learn. 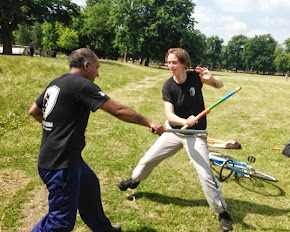 Additionally, there are many types of Escrima systems out there, I should know I have tried most of them, but Escrima Concepts as taught by Master Steve Tappin appeals to me the most; it encourages a realism and energy missing elsewhere. The things I like most about teaching are? My interest is in teaching people who have had little or no martial arts training and to see them progress and become proficient at using weapons. People can find it hard to engage in a martial art which focuses primarily on weapons; let's face it, this does not appeal to everyone. It is my job therefore, to make Escrima engaging for the student and fun, while maintaining the integrity and realism that the martial art deserves. It is rewarding to chart the student's progress and to see them over time, become comfortable at using a variety of weapons. Fitness is something which I care passionately about. I am a qualified Fitness Instructor under WABBA (World Amateur Body Building Association). I love training at the gym and i am lucky enough to train at Muscle Works gym in Bethnal Green, surrounded by Pro’s such as Gilbert Alascasti and JD Dawodu among others, is inspiring. I am a regular at White Hart Lane, watching my beloved Spurs. And diet and nutrition are also very important to me, hence my dietary choice of veganism.